Parent to one of the industry’s leading packaging companies, SleekWrapper, which is known for its high-quality automatic flow wrapping machines. Paxiom proudly presents to you our product line of automatic wrapping machine systems. Utilized in various industries like cookies, confections, coffee pods, vegetables, fruits, home goods, medical items, hardware, and more. From entry-level flow packing applications to higher speed requirements, we have it all covered for you. On top of that, we are also the maker of the one of the most versatile automatic wrapping machine there is in the market today. First is the affordable SleekWrapper 40 that has made its way to numerous workstations of small business owners that require only minimal production rates of up to 100 packages per minute and a maximum web width of 15.5”. Equipped with servo drives to assure there are precise positioning and smooth acceleration and deceleration, our Sleek 40 is extremely easy to set up, operate, and maintain. 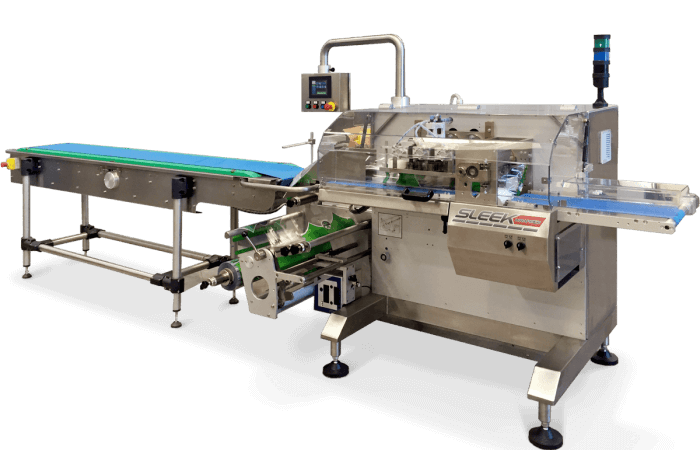 Second is the high-performance SleekWrapper 45 that uses four servo motors to better serve its users by creating quick and easy changeover and adjustment as well as reducing product waste and offering low maintenance costs. Capable of automatically wrapping up to 150 packages per minute with a maximum web width of 18”, this automatic wrapping machine is built for 24/7 environment. Another automatic wrapping machine is our heavy-duty SleekWrapper 65 that can produce as many as 200 packages in just one minute providing a maximum web width of 25.6”. Built also for a 24/7 environment, it comes standard with a quality stainless steel frame and five servo drives. Fourth is the all-new SleekWrapper Inverted. With its unique ability to handle specific types of hard to manage products. Perfect for packaging soft, sticky products, or multipacks. Engineered to safely carry products on top of the packaging film from the former through the cutting head. It has five servo motors and can produce up to 100 packages per minute. The SleekWrapper family of horizontal flow wrappers (Sleek 40, Sleek 45, Sleek 65, and Sleek Inverted) uses eye-mark sensing technology to provide an attractive and consistent finished product. Moreover, these horizontal wrapping machines run on various material types including polypropylene, multilayer, coextruded, foil films, and more. Lastly, they come with standard features such as pre-programmed and stored product set up, stainless steel frame construction, user-friendly color touchscreen HMI, auto open/close rotary fin wheel assembly and rotary seal jaws with jam detecting logic. Finally, down to our last automatic wrapping machine is the Breezy Bagger, a versatile and unique packaging machine that stands out amongst others because of its ability to operate both horizontally like a conventional flow wrapper and vertically like a vertical bagger depending on the product. Lastly, with a simple turn of a wheel, you can quickly pivot from a horizontal position to a vertical one. It can also be operated automatically by using the foot pedal.